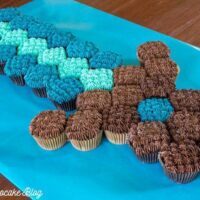 Surprise the Minecraft fan in your life with this simple and fun Minecraft Sword Pull-Apart Cupcake Cake! Earlier this week, I shared with you the princess pull-apart cupcake cake I made for Emily’s 6th birthday. 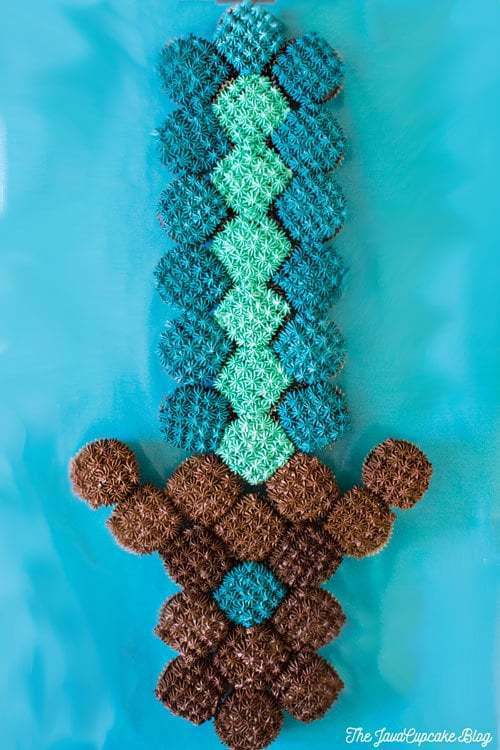 Today, I’ve got her twin brother’s Minecraft Sword pull-apart cupcake cake for you! Say hello and happy birthday to Jakob! 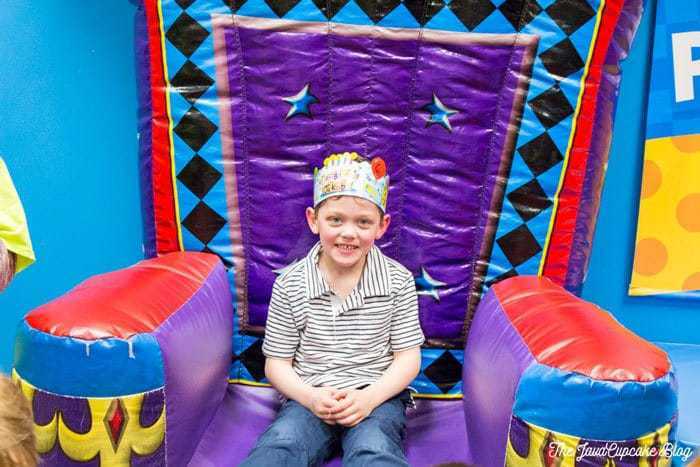 His mom Amy hosted a big party with classmates at a local jump house and it was a blast!! Jakob’s cupcake cake was a little more labor intensive than Emily’s princess one. The same amount of planning went into putting his cake together, it just took a bit more time. 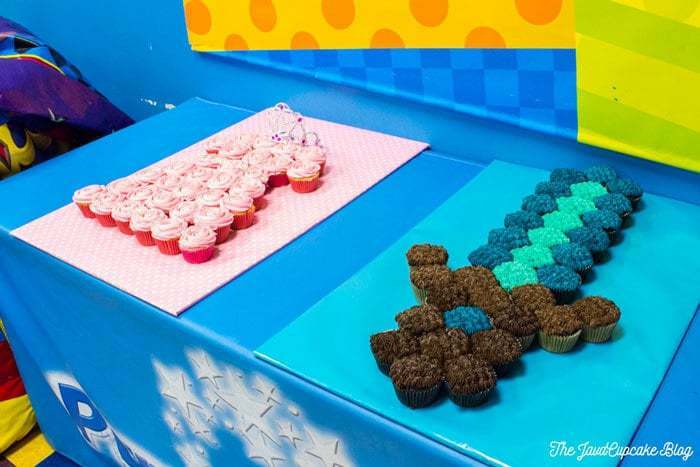 The bulk of the work went into piping the frosting to look like pixels, just like in Minecraft! Cover the foam board with the wrapping paper making a smooth, clean surface to place the cupcakes on. Fit medium star piping tip onto the piping bag and fill with light blue buttercream. Start with the light blue frosting and pipe 5 small stars across a cupcake (in a black liner) down the center of the cupcake. Repeat filling the top of the cupcake with stars until you have 25 stars shaped in a square. 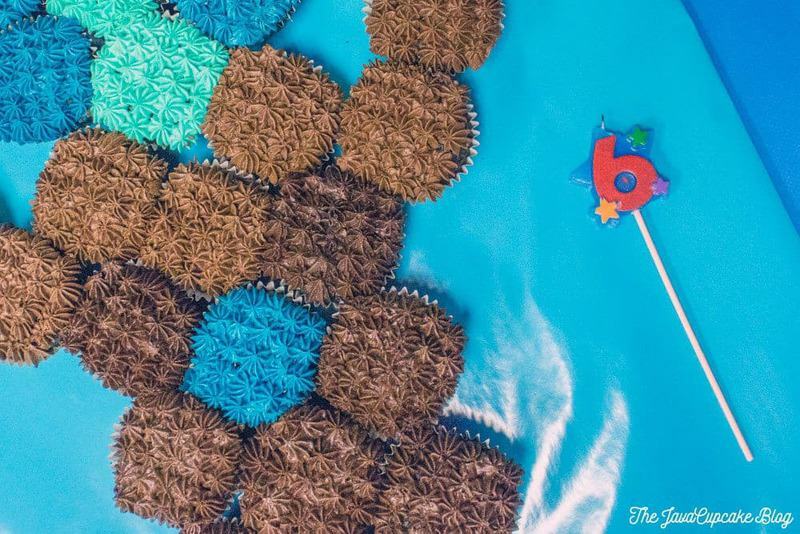 You want to make SIX 6 light blue cupcakes in black liners. 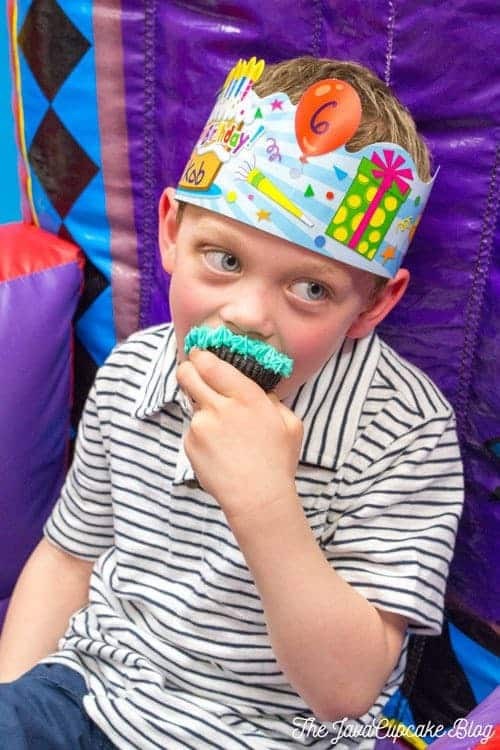 Repeat this piping process with the dark blue frosting and make TWELVE 12 dark blue cupcakes in black liners. Finally, with the dark brown frosting, pipe 5×5 rows of stars onto cupcakes in the gold liners. You’ll have a total of NINE 9 brown cupcakes in gold liners. 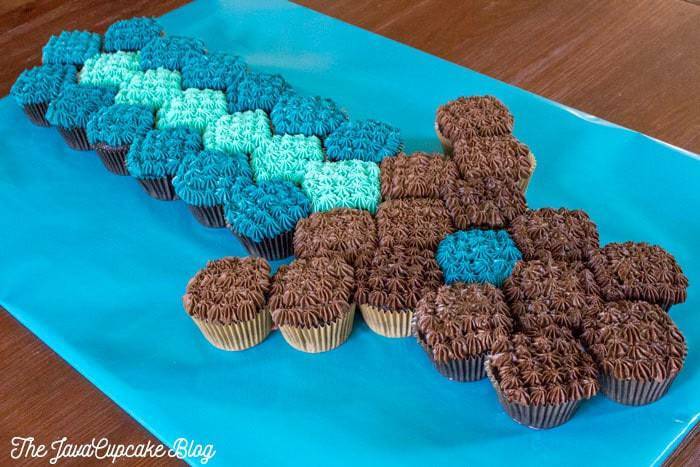 Using the photos as a guide, line up the cupcakes on your prepared foam board. If you’re traveling, apply a small dollop of frosting to the bottom of each cupcake to attach it to the board. This will act like glue and prevent the cupcakes from sliding. 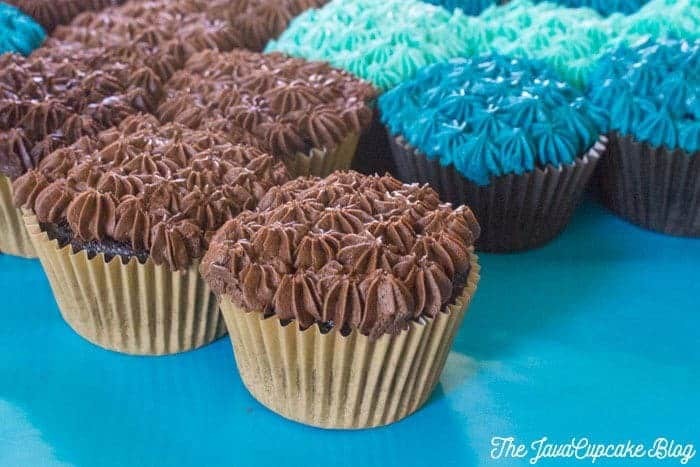 Be sure to be mindful of direction you place each cupcake, you want them to all be facing the same direction and uniform. In your stand mixer, whip together the butter and shortening until combined. Add the vanilla, salt, and powdered sugar and mix until incorporated. Scrape the sides of the bowl and add the heavy cream. Whip until smooth. If the frosting is too thick, add 1 Tbsp more cream until you reach your desired consistency. Whip on high for 2-3 minutes or until light and fluffy. Reserve half the frosting for the brown and set aside. Add a SMALL amount of blue gel coloring to the remaining white and whip until combined. Decorating the 6 light blue cupcakes. Add more gel coloring until you get a deep dark turquoise blue and whip until combined. Let the color sit in the frosting for 5-10 minutes before piping, it will turn deep and dark in color. Add 2-3 Tbsp dark chocolate cocoa powder to the reserved frosting and whip until combined. If the frosting is too stiff, add a small splash of heavy cream to slightly loosen. Allow the frosting to set for 5 minutes to deepen in color. 15 cupcakes should be in solid gold liners not 9. 20 should be in black.